Danger signals in solid organ transplantation (SOT). In the context of SOT, DAMPs can accumulate in the donor organ during the process of donor brain death or as a result of IRI. DAMPs act through TLRs or DAMP-specific receptors to activate innate immunity and enhance the alloresponse by upregulating donor alloantigen presentation, providing costimulation to recipient T cells and driving effector T cell recruitment and differentiation. Cytotoxic T cells and donor-specific antibody generated from the alloresponse can cause acute allograft rejection, which may in turn cause sustained graft injury, thereby potentiating DAMP release. 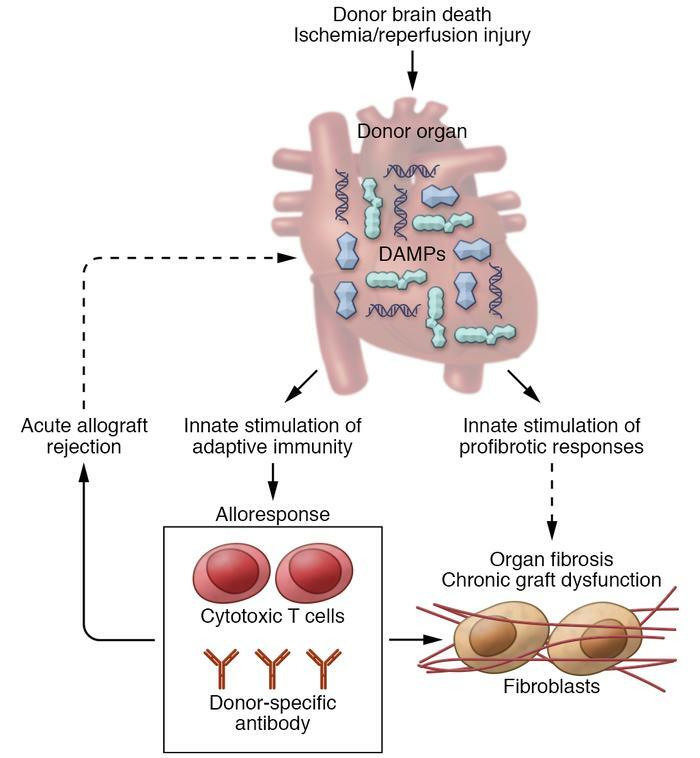 Evolving data suggest DAMPs may also directly promote fibrotic responses, thereby potentially contributing, along with alloimmunity, to the development of organ fibrosis and chronic graft dysfunction.